When I headed out of Ubud on Friday midday, with my Balinese friend A and driver Joni, I was long overdue for a visit to the pemangku (Hindu priest) – the much-revered, referenced, discussed and extremely busy balian tukang – bone healer – of Besakih. 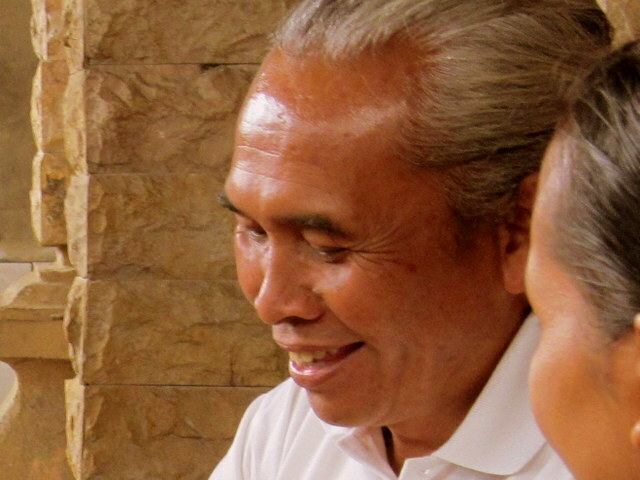 I had heard of this pemangku since shortly after arriving last year, I’d heard of his miraculous healings, his ability to re-set bones, correct hereditary mis-alignment, bring relief to thousands of Balinese who’d long suffered from bone-related pain. Although his reputation was of mythic proportions, I’d never met anyone who could recount to me their own personal experience with the pemangku – until, shortly before I left overseas, my friend A (the same who accompanied me a few days ago) went with her mother and recounted her experiences. That made me decide, finally, to take the plunge myself; it was time for m own pilgrimage to the bone man of Besakih. Joni drops us off and I am pleased to see that th ere is no fanfare as we enter the compound. 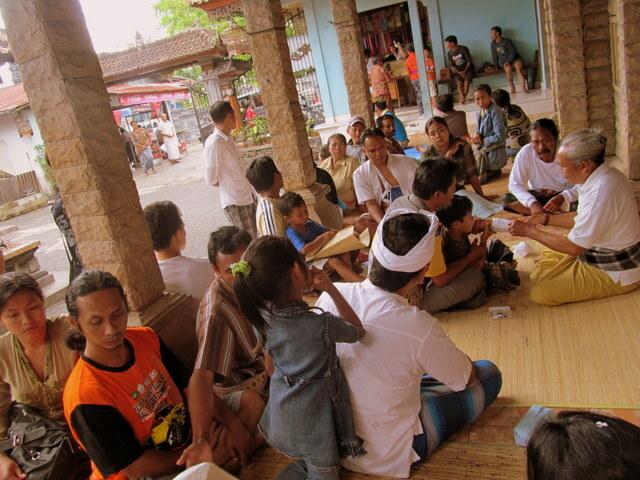 People are sitting on terraces and bales, waiting – as the Balinese are wont to do – for their turn. I am grateful that A knew well enough to call ahead, earlier in the morning, to book an appointment for me; otherwise the wait could be many hours long. With the sounds of a young girl bawling from pain ringing out beside us, A and I approached the ‘reception’ desk (a man wearing a paper mask, handling the phone, an x-ray in his other hand) to obtain a card with my number in the queue – 7. Although we noticed that the pemangku had already begun to see patients, we headed first to his temple at the far end of the compound, where we placed offerings, incense and money, then prayed and were blessed with holy water. We then settled down on the central bale, close to where his patients approach the bone healer, one by one, to be seen and treated by him – in front of everyone else. Nothing is private about this process, I quickly realized, no curtains, no withdrawing to a separate room or niche; discussions are held in public, peoples’ broken bones are shown in full view of the others; everyone’s stories become the others’ gossip and fodder for the rest of the day. You’d best be prepared for prying eyes and ears – by now, familiar and standard fare for someone like me who has lived here for this long. But more than this: not a hint of prescription medications in sight. As for the pemangku himself, he is a wonder to behold: Since 1995, he has been treating the Balinese who hail from all parts of the island. With an easy manner, he listens to each with full attention an d understanding; there is even a glint of empathy in his eyes. Despite the pain and suffering he sees for hours on end, on a daily basis, his face glows, his skin is smooth, the corners of his mouth nearly always upturned in a slight smile – nearly always breaking into an easy laugh. Yes, there is pain, but his proficiency never diminishes his humanity, nor his ability to lighten the mood of even the most disheartened, pain-riddled patient. She is NOT me… but this is how we sat too. After seeing a long line of patients, broken arms, legs, fingers, elbows – as well as those without appointments, unerringly incapacitated or in more dire circumstances being squeezed in well before number 6 and 7 – my number is up. With x-rays at the ready, A and I approach: Om Swastiastu. My friend explains the nature of my accident while the balian skims through the films, noting (more than asking, because it is clear that he is an expert reader of x-rays) where the breaks were, where the damage remains, where the pain and cramps originate. The big problem, he continues with A translating, is in the lower spine, yes? There is too much compression (just like me, adds A.) The pain and cramps go down one of her legs, yes? No operation, he inquires? Ahhh, good thing not, because it will paralyze her. He motions for me to sit in front of him – with my back to him. I balk, A clarifies my hesitation, so he re-directs me to the front of the bale, where I remove my sash, lift the back of my top and … furtively grab for my pillow, puffing it up as I place it on the marble floor, dozens of pairs of Balinese eyes staring at me, low murmurs all around, and do my best (grimaces aside) to perch on top. With my arms stretched in front of me, the pemangku reaches in front of me to turn my palms facing up, and instructs A to stand in front of me, holding my arms. I look into her eyes, hoping that I’m able to hide from her my momentary anxiety. Kneeling on one knee, the pemangku leans his other knee into the middle of my back, pulls my shoulders back. One, two, three… once, twice and then.. CRACK!! He pulls back the shoulders hard enough to give the top of my back a real crunch. I’m dazzled by the sound, by the shift, by the suddenness of it all. It’s over before I know it. He instructs me to take a hot shower and return in one week, for a follow-up appointment. With that, I turn to thank him and we descend from the bale. I leave unsure about what has just occurred; about whether or not a significant physical transformation has occurred in my body. But one thing I am certain of is that I’ve just been in the presence of a man with profound compassion and intuition, with the skill and touch of an expert in his field, with the humility and humor that one might not expect to see in someone held in such high esteem. I was grateful. Humbled. Amazed by this rite of passage. Confirmed. Touched. And, in ways that I didn’t expect, honored to have been guided into his sacred circle of healing. Amit, I read your post hardly daring to breath. You are so brave and I truly hope that he can help you. I have so many questions to ask you but I shall save them for when we meet up again. What an extraordinary man, what an extraordinary experience. Not sure if he would be the balian for you re bone cancer – and so sorry to hear that… but you can try looking up Made Surya, write to him and ask – he’s very informed about which balian is able to help out with which illness/injury. Let me know if you are back in Bali, we can try to meet.. good luck and let me know if I can help in any other way! Amit, do you have an email address that i can write to you? It’s related to Bali but i do not wish to write my personal details in your blog. Happy to help, can you give me your email and I’ll connect with you soon? thnx! Sure, happy to help! Can you give me your email and I’ll get in touch soon. thnx! I was wondering if the Bone man can treat old fractures? Is it possible to ask him before i go all the way there? I’m in India currently. Please help! Hello Bharat, Thanks for reaching out and contacting me. I’m sorry to hear about your fractures, and I assume, resulting pain. I’ll reply to your questions via email. Thank you for the info, my fiance got accident on Sunday and he brokes his upper arms, would be nice if we could visit him. Do you have still address of him? Too bad about your fiance; I hope he’s feeling better by now. Sorry no.. the last time I asked about the bone healer, I heard that he had retired.